I continue enjoying visits from the wintering Cedar Waxwings, Bombycilla cedrorum. 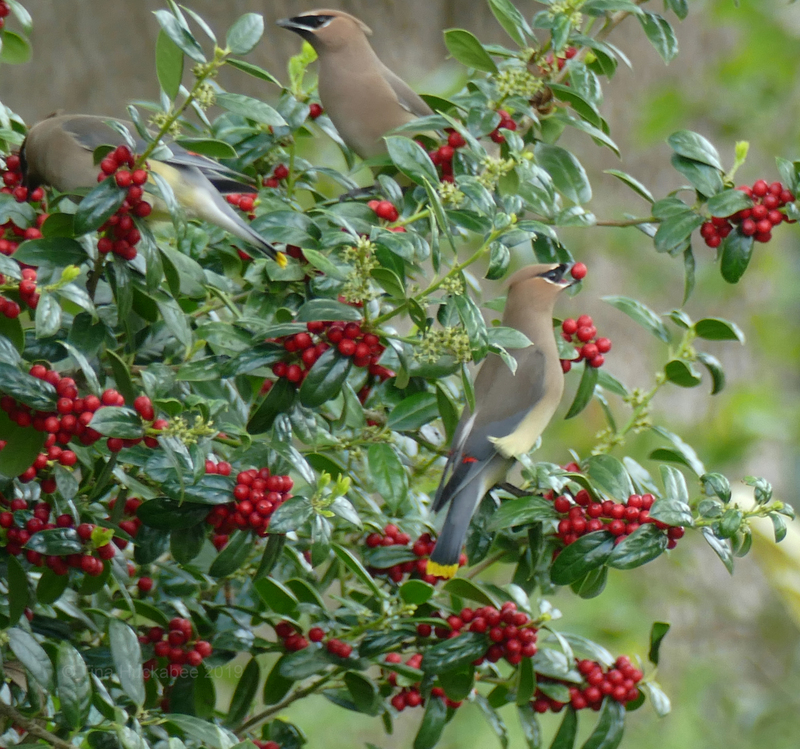 An afternoon or two ago, I observed as they laid waste the berries on a neighbor’s Possumhaw holly, Ilex decidua, and wondered at that time why they hadn’t descended upon and devoured the berries on my Burford holly, Ilex cornuta, shrubs. 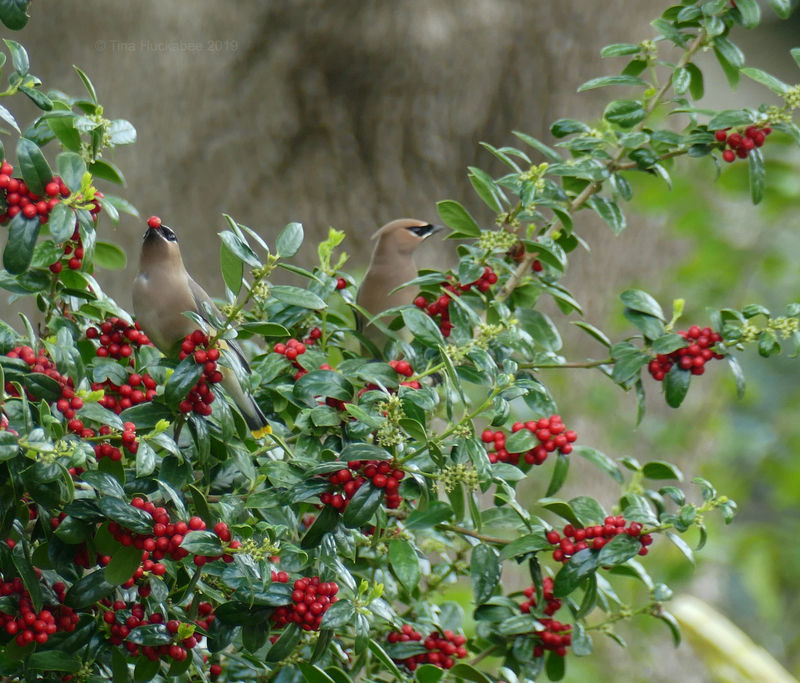 A gaggle of waxwings found the shrubs and went to work–flitting, flapping, berries in beaks. I assume waxwings ate the few berries that were on my Possumhaw–someone did– though I never actually saw any in that tree. The Burford holly shrubs are located in a more easily viewed spot. It was quite a show. This one looked straight at me as he gulped a fruit, though probably didn’t see me. I was well hidden in another corner of the garden. There are plenty of berries remaining; I wonder if they’ll return before they make their way northward? The shrubs are also now blooming their tiny white flowers and the honeybees and hoverflies are at their pollination work. There’s never a dull moment in the garden. 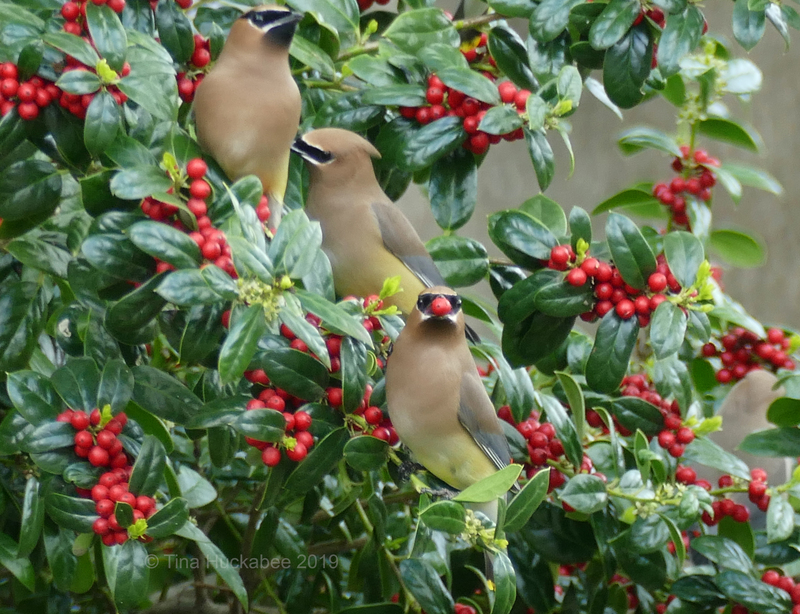 This entry was posted in Burford Holly, Cedar Waxwings, Possumhaw Holly, Uncategorized and tagged Bird Migration, Urban Wildlife by Tina. Bookmark the permalink. I’ll bet you are, but they’ll be winging their way to you and very soon! You were lucky to see them again and get some shots off. I do believe they came back to finish off my holly, as we noticed there is not a single berry on it or on the ground. Yes, I agree, although the waxwings have hung around my neighborhood more this spring than any that I remember. It’s been a mixed bag this winter/spring: lots of waxwings and American goldfinches, not as many Orange-crowned warblers and Ruby-crowned Kinglets. Thanks! 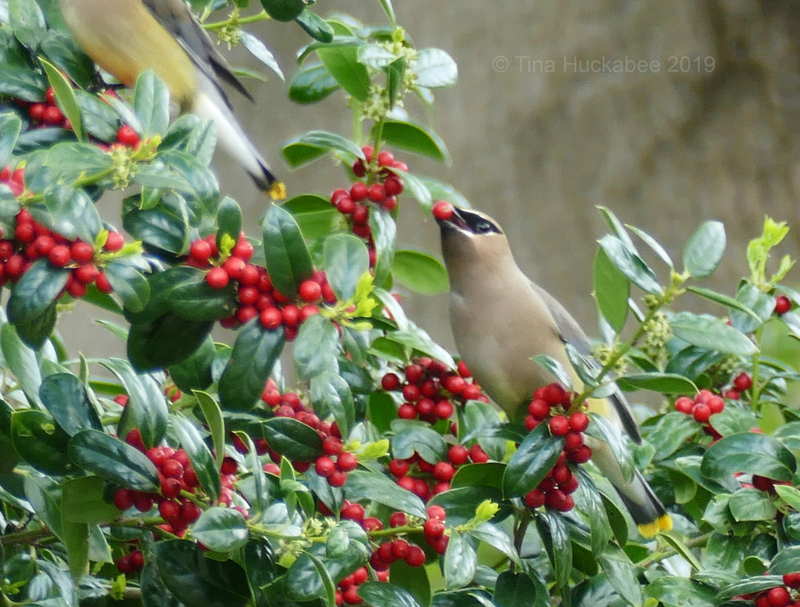 I was tickled that I finally got a shot of berries in beaks. I was a little far away and cropped the shots, so the photos are great, but I’m okay with that. They are gorgeous, fun birds to watch. Thanks, Maggie. Always something to see! Wonderful photos of one of my fav birds! They’re just beginning to appear again in our area of New Hampshire. Oh, wow! Is that early? I would have thought they’d show up a little later in spring. Enjoy them, they’re so fun to watch. Amazingly, some even winter in New England. When the cedar waxwings got to the yaupon outside my window a month ago they made quick work of the fruit. As you say, it’s enjoyable to watch. When they’re ready, they get right to it. I’ve never actually seen them at my Burford hollies. I usually come home and the berries are gone. Do they only feast in groups? Have you ever seen a loner off somewhere eating calmly, not worried about getting enough? Oh that one shot with the berry in it’s mouth! Made me smile! I have been anxiously awaiting my flock of friends here in NC. They’ll be on the way very soon! Our current home has two ancient holly bushes, I’m unsure of the variety. The bees though… Wow. Is this your new house, or old? Yes, bees love holly–any variety, it seems–blooms! It’s our rental that we’re in currently (between houses.) The duplex was built in 1983 and judging by the trunks they might be that old. My burfords were planted just a few years later. Even though I have seen pictures of them online for a while, they still look so unreal! There is nothing like the here. Bluebirds and cardinals are just as foreign. Don’t they? Their markings and coloring is unique and oh so beautiful. I don’t get bluebirds here in Austin, though they’re common north of here. Blue jays and cardinals are year-round residents. I don’t know which is more beautiful, the berries or the birds! Haha. I though the same! In the UK we have Waxwings (Bohemian not Cedars) visit in the winter from Scandinavia. They are gorgeous birds, you are lucky to have them visit your garden! Oh, that’s interesting. Are your Bohemians these Bohemians? https://www.allaboutbirds.org/guide/Bohemian_Waxwing/overview These are in the northern parts of the US and well into Canada. I’ve never seen one, but we love our Cedar Waxwings! They’ll be leaving us in the south soon and heading northward for breeding. Oooh, worth doing some research—did yours evolve from ours, ours from yours, genetic differences? Inquiring minds want to know! Beautiful shots, btw! Oh, I love the cedar waxwings! I’ve heard them flocking here and I’ve seen them from a distance, but not close up yet. They tend to go crazy for the flower petals of our Crabapple trees in mid-spring, and the ripened fruits in fall through early spring. They are fun birds to observe. Interesting about the petals, though I’ve heard of other birds eating petals, so I guess I shouldn’t be surprised. The Crabapple sounds like an A+ wildlife plant. I hoped all spring to see them again, but no luck. I know they’re sort of in the neighborhood — a friend in Alvin sees them consistently — but I suspect there’s been so much food available this year they haven’t had to resort to our palms. All of the fruits still are hanging on them, and that’s probably a sign that the possumhaw, yaupon, and such are keeping them well fed. I think they’re one of the most attractive birds, and highly photogenic. Your pictures are great! Thanks, I’m learning to be patient with the camera. Birds are tough though; they won’t stay still. I’m sorry you haven’t seen waxwings, they really are just gorgeous birds–alone and in their groups–to observe. Love these pics! Possumhaw is not hardy where I live, I think. Thanks! I’ll have to check the LBJWC database, but you may be right.